166.37 x 114.3 cm; 1 tapestry; silk thread; gold, red; wooden frame; brown. Dr. Lawrence’s Daughter donated this tapestry to the Board of Trustees of the Cumberland General Hospital in 1958. 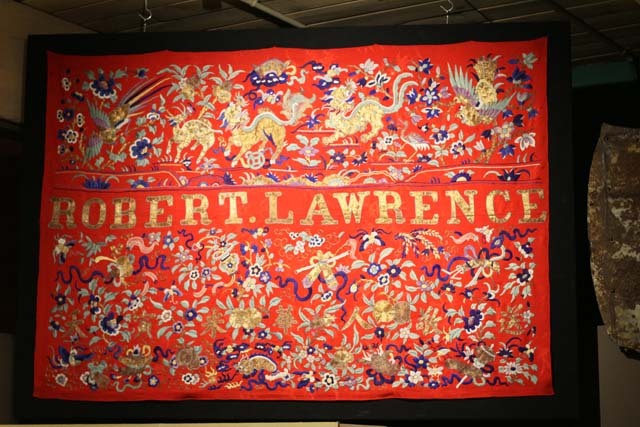 This tapestry was gifted to Dr. Robert Lawrence in appreciation for his services to the Chinese community in Chinatown, Cumberland B.C. He was given this gift when he moved to Vancouver B.C. -The Chinese Community in Cumberland had this tapestry made in China for $500.00. Dr. Robert Lawrence was the first doctor in the Cumberland area and he was also the treasurer of the original hospital board. Dr. Lawrence served the Cumberland miners from 1890-1900.